Profile Response – James Huggins, Twelve Tribes Community Cambridge, NY | How Will We Live Tomorrow? I passed James sitting on his front porch on a Saturday morning. When we waved to each other, I noticed the sign about the porch and decided to stop and chat. 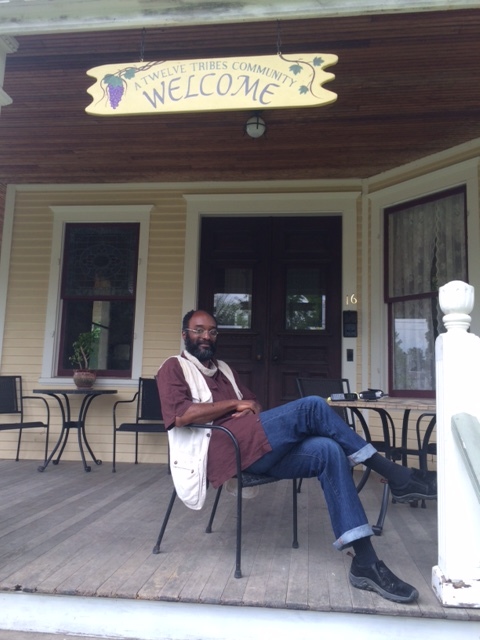 James has lived in this Twelve Tribes Community, a large nineteenth century house on Main Street, for 22 years. The community is rooted in Acts 2:4: All of them were filled with the Holy Spirit and began to speak in other tongues as the Spirit enabled them. This entry was posted in Responses and tagged Cambridge NY, James Huggins, Twleve Tribes Community. Bookmark the permalink.